I am a Mac user and one of my friends tried to connect to my MAC using his Teamviewer. But he said he wasn’t able to control my device. Anyone of you experienced the same problem? How can I fix this issue? Are you sure that you allowed your friend to control your MAC? 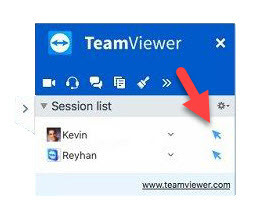 Make sure that the cursor icon on your Teamviewer configuration box looks like this. When clicked on it, it will show you a line over the cursor icon which will disable the control of that user.